Let's face it: college textbooks are insanely expensive. And, at the end of the term, the bookstore gives students virtually nothing back for their books. We believe in a better way for students to sell their textbooks quickly, conveniently, and for a fair price. How we do that is by providing an online service to give you cash for your books in three easy steps: 1) get an instant price quote online, 2) ship for free by using our prepaid mailing label, and 3) get paid promptly via check or PayPal. We believe in providing our customers with useful tools to make the process even easier. That's why we built our iPhone and Android apps, so that students can scan their textbooks instead of typing out the ISBNs. We believe in outstanding customer service. That's why our customers get a live person when they call (5 days a week). Our awesome Customer Care Team is standing by: 1-877-243-5935. We believe that it is important to do things the right way, and to create relationships based on trust. That's why we invite every single customer to leave us feedback on our Trustpilot.com account, and we work diligently to maintain an excellent feedback score of 9.2 out of 10, or higher. We believe that you should get paid as fast as possible. That's why payments are issued within 1 business day of books arriving in our warehouse and getting processed. Every morning, 5 days a week, checks are printed, stuffed and mailed with TLC to Cash4Books customers. PayPal payments are also initiated every morning, 5 days a week. If you are looking for someone that you can really count on, give us a try. 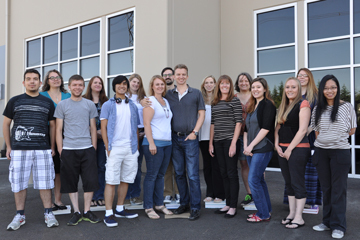 Cash4Books is a family owned company, started in 2004. Jim and Breanne Smith are the owners. 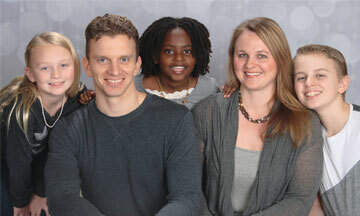 Here they are shown with their three children: Mekiah, Abrielle, and Josanna. Read their story here.